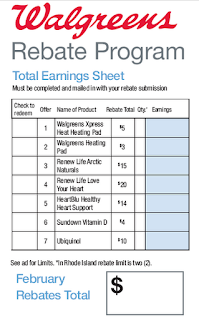 I love the Register Rewards program that we currently enjoy at Walgreens, but it does come with some headaches. Back in the day when the Easy Saver Rebate program was in full swing I loved it as well. Although it’s rebates instead of coupons, the ESR (Easy Saver Rebate) program has a lot of great perks. Very few of the rebate items require a upc to be submitted. They can see and track the purchase by the number on your receipt! If the rebate limit for an item is 5, you can purchase all 5 in the same transaction and still get the rebate for all 5. 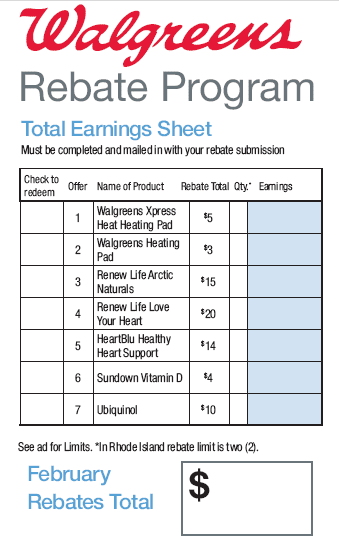 If you request your rebate in the form of a Walgreens gift card, you’ll receive a 10% bonus added to your rebate amount. Since checks can be deposited and gift cards never expire, there’s no need to visit Wags weekly to “roll” your rewards. You can spend the rebate amount in any increments you want- there’s no having to spend the whole RR amount. You have 4 or 5 weeks to make your purchases, so if the item is on sale but out of stock you can get a raincheck and still be able to submit for your rebate as long as you purchase the item within the rebate dates. Trust me- there weren’t nearly as many empty Walgreens shelves 10+ years ago on Sunday afternoons! First, be sure to pick up the current month’s IVC booklet that is usually found by the weekly store ads. The monthly rebates are listed at the back of this booklet. Tally up the total earnings and choose how you want to receive your money back. I almost always choose gift card because it give the extra 10% reward on my rebate amount. When you reload a gift card that you already have, the money is available to spend about a week earlier than requesting a new card since it doesn’t have to be mailed. I also like to have some “Walgreens money” that doesn’t have a 2 week expiration on it. The other options are paypal deposit, check, or prepaid visa. You can mail your rebate or submit it online. Online is quicker and you have a confirmation that it was received. Plus you still have your receipt for your purchases in case you purchased the wrong item and need to take it back. Many times I’ve had my rebate show that I purchased the wrong item but I know it was the correct one as show in the booklet and tagged on the shelf. All it takes is a simple call to the rebate customer service line and they’ll get it corrected for you. If you’re loading it to an existing GC it will be added in 2 days (as compared to 6 weeks to get a replacement RR)! You can track the progress of your submission through the phone number you included on the rebate form. Once you receive your rebate back a couple of months in a row you’ll be able to keep rolling that amount to other rebate items without that 2 week expiration like the RRs. If the limit is 1, that’s all you can get- no coming back another day for more. It can be easy to forget to submit at the end of the month. Definitely set yourself up a reminder in your calendar. programs to work with. Have you participated in the ESR program before? Which program do you prefer and why. but a few weeks ago i did their rebate for some of the vitamins and i profited quite a bit because i had a coupon and combined it with another offer. i was astonished at how easy it was to file my rebate online! i will be even more happy with it when i get the gift card. and i love the 10% bonus! you make money, no matter what.